Rustic Pine Buffet Sideboard Media Cabinet Brass Handles! The Aspen Sideboard Buffet is ideal in a dining room but it is also the perfect size for a media cabinet (note the pre drilled cord holes on back side). 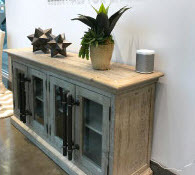 The rustic wood finish is in natural tones and gray tones, with solid brass long handles that make the perfect statement! Beautiful glass display doors and interior storage shelving for a functional timeless piece. ** Please note that there may be slight variations with the photos and the actual product itself. Also variations in color(s) may occur due to the resolution settings on your computer.